and their mother, the widow Theodota. All were martyered in the year 303. Cosmas and Damien saw in every patient a brother or sister in Christ. For this reason, they showed great charity to all and treated their patients to the best of their ability. Yet no matter how much care a patient required, neither Cosmas nor Damien ever accepted any money for their services. For this reason, they were called anargyroi in Greek, which means "the penniless ones." Every chance they had, the two saints told their patients about Jesus Christ, the Son of God. Because the people all loved these twin doctors, they listened to them willingly. 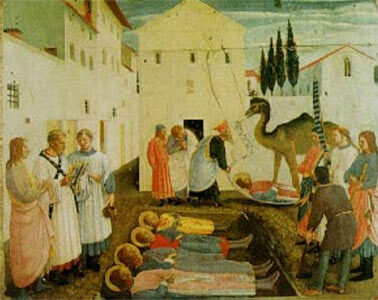 Cosmas and Damien often brought health back to both the bodies and the souls of those who came to them for help. 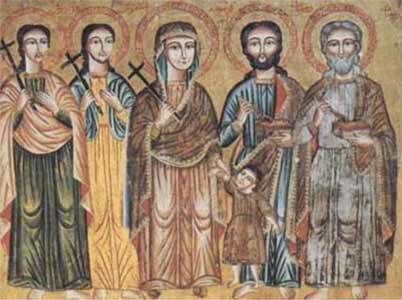 When Diocletian's persecution of Christians began in their city, the saints were arrested at once. They had never tried to hide their great love for their Christian faith. They were tortured, but nothing could make them give up their belief in Christ. They had lived for him and had brought so many people to his love. So at last, they were put to death in the year 303. Diocletian's edict in 303 demanded religious uniformity and the elimination of the Christian sacred literature. Christians who refused to cooperate could face death. It was said that Cosmas and Damien, after refusing to worship the Roman idols, had survived several devious means of torture and death, and were finally beheaded. These martyrs are named in the First Eucharistic Prayer of the Mass and in the Litany of the Saints. was built over their tombs. Their feast day is September 27. Cosmas and Damien followed the instruction Jesus gave to his 12 apostles, which was relayed in the gospels of Luke and Matthew. "He sent them out to proclaim the kingdom of God and to heal (Luke 9:2), and instructed them "Cure the sick, raise the dead, cleanse those suffering from leprosy, drive out devils. You received without charge, give without charge." (Matthew 10:8). These two appear to have been especially revered for adhering to this latter teaching, which was rarely followed by others. As a result, numerous churches, monasteries, and schools have been named for Cosmas and Damien. A basilica in Rome was erected in their honor two centuries after their deaths by Pope Felix IV (elected Pope 526); at the time there were already five churches dedicated to these medical martyrs in the city. 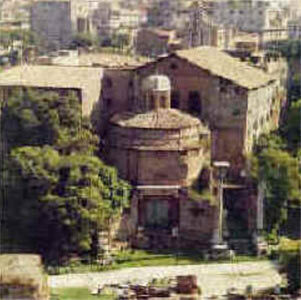 The basilica was built in an area of Rome considered the zone of medicine, replacing a structure that was part of Vespasian's Forum of Peace, and dedicated in 530. At about the same time, Emperor Justinian I restored the city of Cyrus in their honor. Although the remains of Cosmas and Damien are at Cyrus, there are also relics preserved in the crypt at the Roman basilica. Over time, the basilica went through numerous changes, with deterioration followed by restoration, with additions and reconstructions. In 1503, the basilica was consigned to the Third Order Regular of St. Francis for maintenance (formally transferred in 1512) and this religious order manages the basilica to this day. 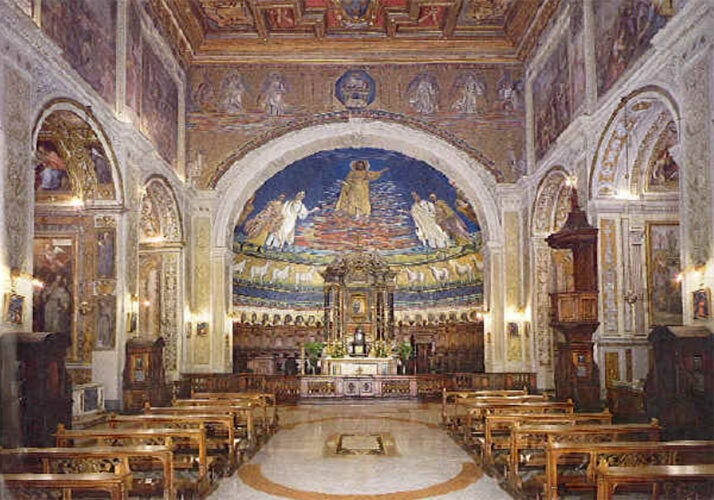 Interior of the Basilica in Rome. In the renowned mosaic from the original construction of the basilica, Christ is flanked by St. Cosmas and St. Damien, who stand with St. Peter (next to Cosmas) and St. Paul (next to Damien); the Apostles, with arms around their shoulders, are introducing them to Christ. St. Theodore of Tyre (a soldier who converted to Christianity and was also martyred during the Diocletian persecution) and Pope Felix IV are also depicted, the latter with a model of the church in his hands. They stand on golden water plants, symbolizing the river Jordan. Below is the Lamb of God with 12 sheep symbolizing the Apostles. The Latin inscription accompanying the mosaic is translated as: "God's residence radiates brilliantly in shining materials, the precious light of the faith in it glows even more. The secure hope of salvation comes to the people from the martyred doctors, and from the sanctity of this place derives honor. Felix offers this worthy gift to God, so that he might live in the heavenly abode." 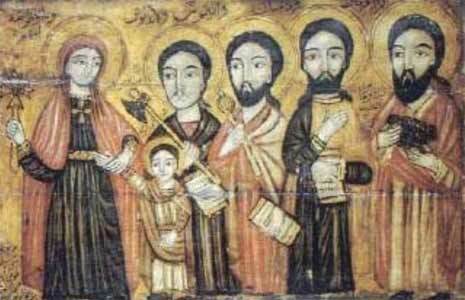 O My Jesus, Saints Cosmas and Damien were twins who became excellent doctors. They refused payment for their medical care because they believed that when they treated patients, they were also caring for You. By conveying great love, they won the hearts of their patients as they taught them about the Faith. I ask them to pray for my special skills, that I use them for Your glory. I also ask them to pray for all those in the medical field, that they grow in generosity of spirit. Bring conversion to the unsaved and teach Christians to serve You through their professional lives. 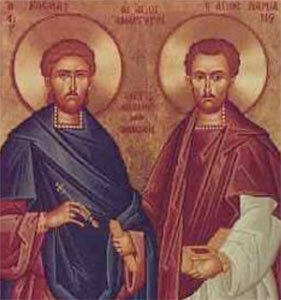 Saints Cosmas and Damien, pray for us. Amen.